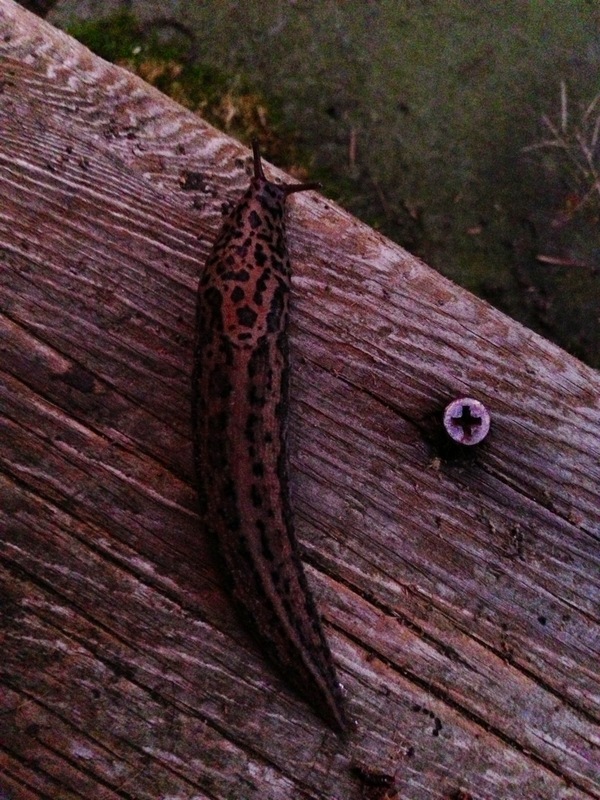 I thought the leopard slug I discovered on the porch yesterday at dusk was the worst thing I’d seen this summer. Almost the length of my hand, it trailed its silvery sap behind it, creeping along the boards as though it hadn’t a care in the world. I could easily have smushed it with my bare foot, on my way to watch the fireflies. These creatures, genus Limax, live beneath the weathered floor boards in some comfortable arrangement I imagine as including a cigar box bed out of Mary Norton’s The Borrowers. But ookier. Hermaphrodites, the slugs have an unusual style of mating, using a thick thread of mucus to hang suspended in the air from a tree branch or other structure, an intense balcony scene to beat Shakespeare’s. The leopard slug was first spotted in the New World relatively recently, in a Philadelphia basement, in 1867. How’d it get up to my house? This morning, another discovery, when Gil was mowing the grass. He laid it out on the porch. 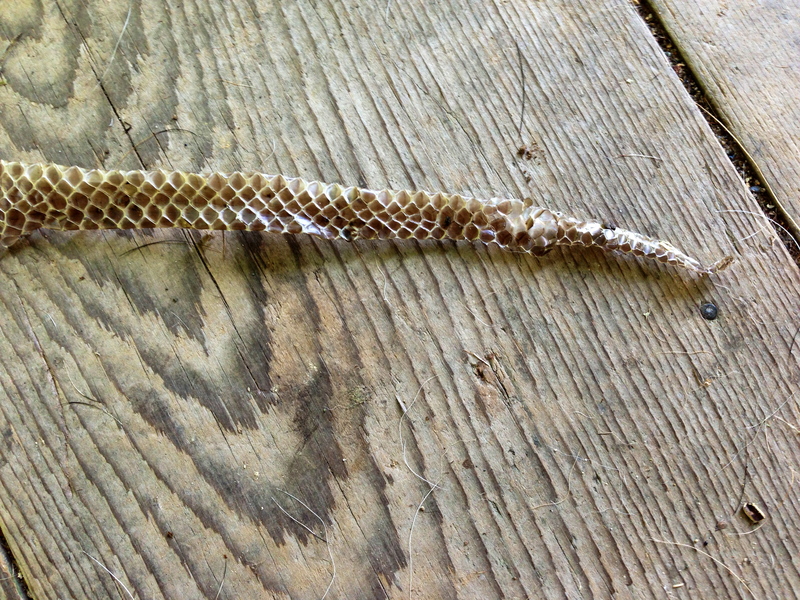 The shed skin of a snake, long and dry. I saw this very snake not so long ago, out a window, as it travelled across the back forty towards the Cabin. Jet black and thick as my wrist. Moving in a straight shot towards me. Purposeful. We know they hole up under the clapboards at the back wall of the house because we’ve found their skins there before, left behind like a tossed-aside, too-tight jacket. A black rat snake such as this one consumes mice and rats and sometimes even chipmunks (I noticed a decline in the chipmunk population around the cabin). It exudes an unpleasant musk as a deterrent to predators, but is known to be shy and will freeze, supposedly, if it spots you close by. It’s not poisonous, but if provoked further it will snap. 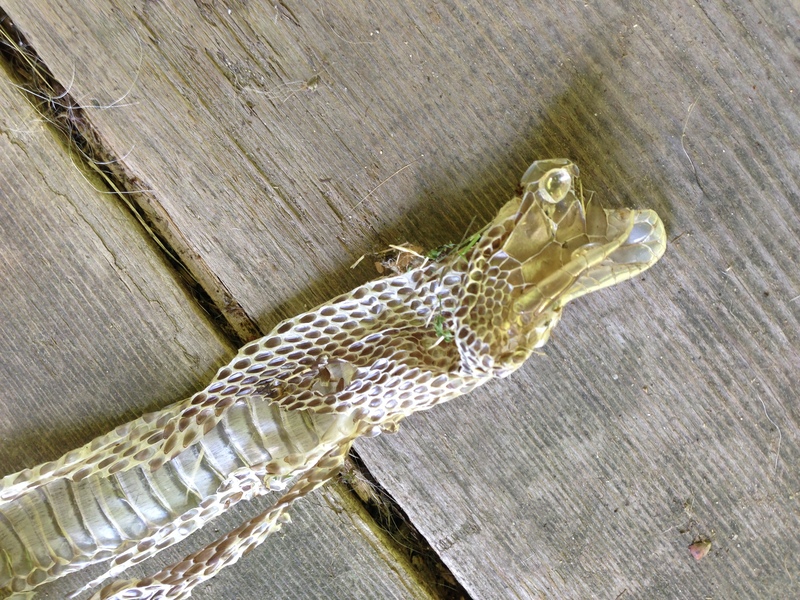 Perhaps the rat snake will find the leopard slug appetizing. 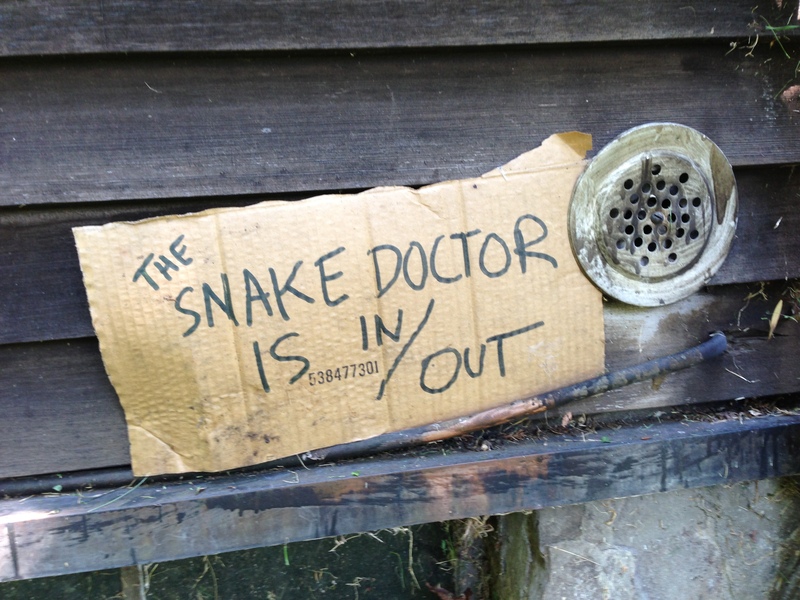 But what will eat the rat snake? Wow, that’s terrifying. You’re a better woman than me, poking with a stick. I’d run first. One of those big, black bad boys slithered across our front steps, through our weed and flower garden, and then tried to wedge himself in our basement. The door was open a crack to allow for an extension cord, and he was trying to get in. 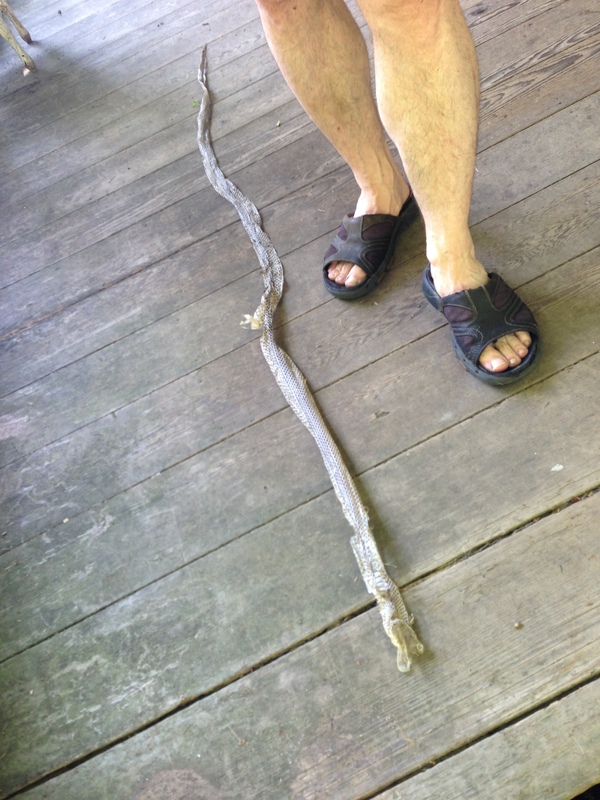 So I poked him with a stick and asked him to leave. I was very polite, but he turned on me. Snapped. I jumped back and landed on Lyle, who fell over. And then I fell over. And the snake was watching. Waiting. It was a scene from a bad dream. I acted quickly. I picked up Lyle and ran backwards. The snake pursued as a warning only, then he turned and went up the hill through the pachysandra. I saw the last of him as he slunk down a chipmunk hole. P.S. Check the bike photo that I posted … my Aunt Lizzie in 1896 … biking 25 miles in that costume.